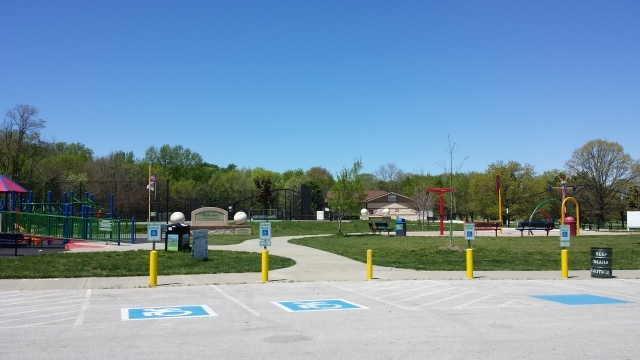 AllPlay Complex is located in Seymour Smith Park, 6802 Harrison Street, Omaha, Nebraska 68128. 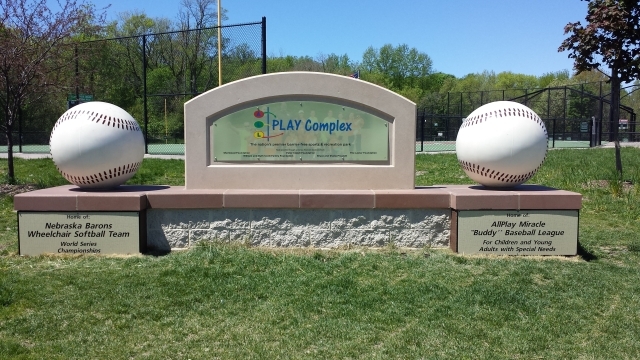 This $1.5 million dollar park was built in 2008 and was designed with barrier free features. 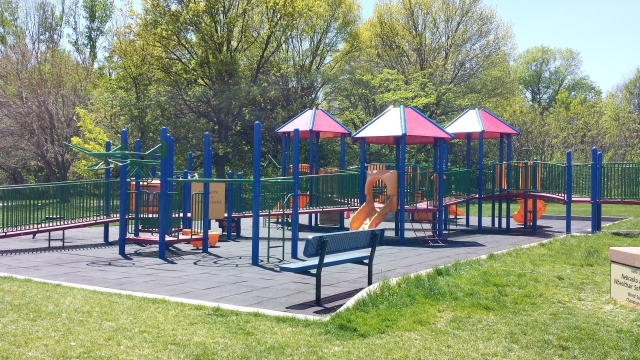 Priority use and reservations are given to organizations providing services for people with special needs, but areas of the complex are available for rental and private use. The inside of the concession / storage building are not available for private rental or public use. The restrooms that are part of the concession stand building are only open and available during private events. Portable restrooms are provided and maintained by the city of Omaha are available for public use and located by the water park. You can bring in any food and drink (subject to Seymour Smith Park rules established by the City of Omaha Parks Department - see below). ​All trash must be placed in the receptacles provided. There are two electrical outlets located on the exterior of the concession building available for use, and one outlet near the flag pole may be used with the rental. 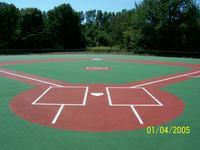 There is currently one grill available near the batting cage and flag pole, and grills may be brought in and used. Grills should NOT be used on the picnic tables and grease from your grills must not be left on the hard surfaces. There is one drinking fountain available for public use on the concession building, and hot and cold water is available from the restroom sinks if needed. Reservations are accepted on a first come - first get basis. Click on the green reservation buttons on this page to complete the online reservation form. Reservations are not complete until funds are received. Payments may be made with credit card via PayPal, or checks may be mailed (post mark on envelope will be used for payment date). Upon completion of your online reservation form and receipt of payment (credit cards are accepted) your reservation will be posted to the AllPlay calendar and a permit will be emailed to you to confirm reservation. On the day of your reservation the area will be posted with your reservation, and instructions will be sent to you about how to access the key lock box used for use of the restrooms a few days before your rental time. no open fires (except for grills). Grills should be set-up on a grass area to avoid grease on concrete. Grills should NEVER be set or used on the picnic tables. no water balloon fights (messy and clean-up is difficult). AVAILABILITY: Please see the calendar below for availability. You can click on the reservations and events shown for more details. If an event is shown it will also have a time associated with the event. This means the complex is NOT AVAILABLE to be rented during this time. 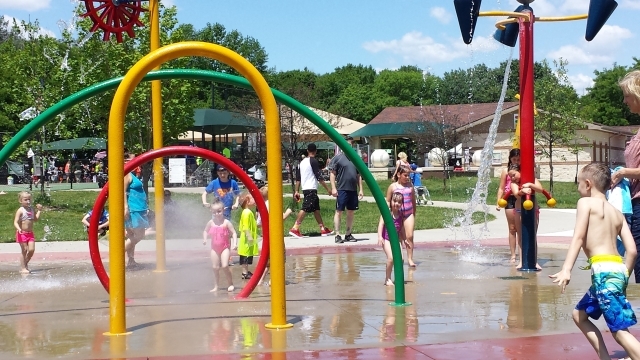 The water park and playground are always available for public use regardless of reservations of the fields, pavilion, and restrooms. Click on the "Agenda" calendar view to see more details on reservations.